My husband took me to an upscale steakhouse a few years back for our anniversary. The waiter took us back to a candle lit booth in the back of the restaurant where he had scattered rose petals at my husband's request. We ordered some spinach artichoke dip that was heavenly. What a night that was! Whenever I eat spinach and artichokes artfully blended together with creamy flavor, I think of indulgence, luxury, and yes, a bit of romance. 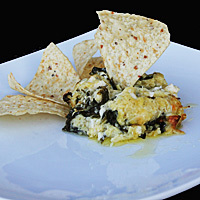 Every cook needs a recipe for Spinach Artichoke dip. You can order it at every restaurant and find it in any cookbook: it's a staple, and rightfully so. This version will hold up to any steakhouse appetizer menu and cost a lot less. 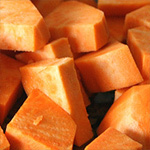 The key, as with most things on our site, is to use fresh ingredients. 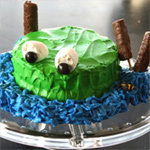 I've adapted this recipe from my niece's, so thanks for the help, Amy! Assemble the ingredients. I prefer artichoke hearts canned in water, instead of the kind brined in flavored oil. Both will work, however. 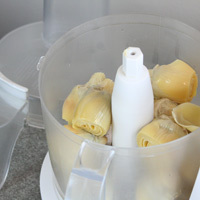 Process the artichokes in a food processor until finely chopped. 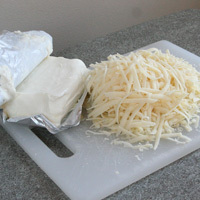 Grate the Mozzarella and Parmesan cheeses. I bought my parmesan pre-grated, but it does taste better if you grate it yourself. Don't add more cheese. It doesn't make it more decadent, just greasier. Next, wilt down the spinach until it releases it's water: Add the spinach to a dry pan on med heat, crush the garlic over the top and sprinkle with a little Kosher salt. 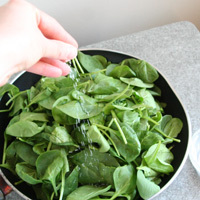 Cook for five minutes, or until the spinach is wilted, turning the spinach with tongs every so often. It loses a lot of volume during this process. If I wasn't making a dip, I'd add a little heavy cream and have creamed spinach at this point. 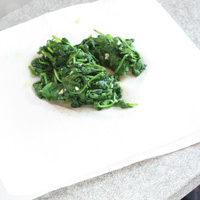 Place the spinach in a paper towel and squeeze out any remaining water. 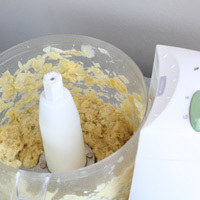 In a large mixing bowl, combine all ingredients until evenly distributed. Add cracked pepper to taste, about 1/4 t Transfer to a 9x13 baking dish, cover with foil, and bake at 350 degrees for 30 minutes. 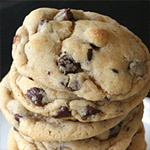 Remove foil and continue baking until the top is browned, about 15-20 more minutes. 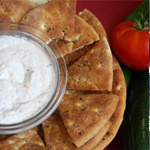 instead of the kind brined in flavored oil. Both will work, however. Grate the Mozzarella and Parmesan cheeses. I bought my parmesan pre-grated, but it does taste better if you grate it yourself. Don't add extra cheese. It makes the dish oily, not more decadent. Next, wilt down the spinach until it releases it's water: Add the spinach to a dry pan on med heat, crush the garlic over the top and sprinkle with a little Kosher salt. 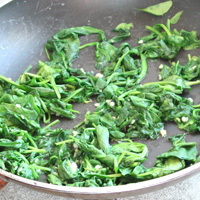 Cook for five minutes, or until the spinach is wilted, turning the spinach with tongs every so often. It loses a lot of volume during this process. If I wasn't making a dip, I'd add a little heavy cream and have creamed spinach at this point. 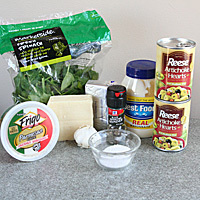 Place the spinach in a paper towel and squeeze out any remaining water. 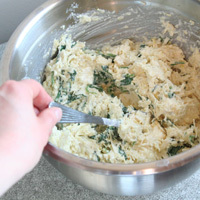 In a large mixing bowl, combine all ingredients until evenly distributed. Add cracked pepper to taste, about 1/4 t.
Transfer to a 9x13 baking dish, cover with foil, and bake at 350 degrees for 30 minutes. Remove foil and continue baking until the top is browned, about 15-20 more minutes.